Much of the world—including the United States—faces increasing conflict as Earth’s human population continues to grow but the supply of good, clean water decreases. Water shortages and the struggle to determine how much should be used for agriculture, industry, recreation, wildlife and drinking have sparked legal and policy battles. In addition, pesticides, pollution, invasive species, climate change and droughts threaten the availability of good, clean water. Resolving these complex issues requires the best scientific information and training of natural resource scientists, managers, engineers and policymakers. The National Science Foundation established a National Research Traineeship program at the University of Nebraska-Lincoln to meet this need. As stated by the National Science Foundation, NRT programs are "dedicated to effective training of STEM graduate students in high priority interdisciplinary research areas, through the use of a comprehensive traineeship model that is innovative, evidence-based, and aligned with changing workforce and research needs." The University of Nebraska-Lincoln NRT program trains master’s and doctoral students in understanding resilience of agricultural ecosystems, particularly the Platte River Basin in Nebraska. The NRT students come from multiple disciplines—the natural, computational, engineering, agricultural and social sciences—to study panarchy theory, novel sensing technologies and modeling, adaptive management and policy interventions. They strive to develop tools that can collect, synthesize and analyze data to inform decisions and policies for managing water resources. They hope to keep the Platte River Basin and other agro-ecosystems healthy and resilient for all who depend upon them now and for generations to come. Professor Francisco Munoz-Arriola and student Katharine Hogan spoke about the NRT on a panel, "Innovative STEM Graduate Programs at UNL," 11:15 a.m. to 12:15 p.m. April 16 in the Willa Cather Dining Complex. The panel was part of a day-long meeting with members of the National Academies of Sciences, Engineering, and Medicine who visited the university to discuss "Graduate STEM Education for the 21st Century." Students Conor Barnes, Brittany Kirsch, Alison Ludwig and Daniel Rico presented posters at the university's spring research fair April 15. Student Jessie Johnson attended the THREDDS Data Server workshop on March 25 to learn how to access High Plains Regional Climate Center Data for her master's project. THREDDS allows users to access real-time data on the environment. Students Conor Barnes, Jazmin Castillo, Christopher Fill, Katharine Hogan and Brittany Kirsch attended the Agricultural and Water Law Seminar, March 21 in the auditorium of the College of Law. Speakers addressed agricultural law topics, including legal issues associated with water, the environment, land use, technology, taxation and finance. Doctoral students Conor Barnes, Katharine Hogan and Lyndsie Wszola attended the Grant Proposal Writing: Getting Started workshop March 14 at the university. In March, master's student Daniel Rico was elected a senator in the Graduate College, one of six senators representing graduate students for a one-year term. Daniel Rico won the Outstanding Graduate Student Award from the College of Agricultural Sciences and School of Natural Resources at their awards luncheon on March 8. Memorial Day. University offices closed. 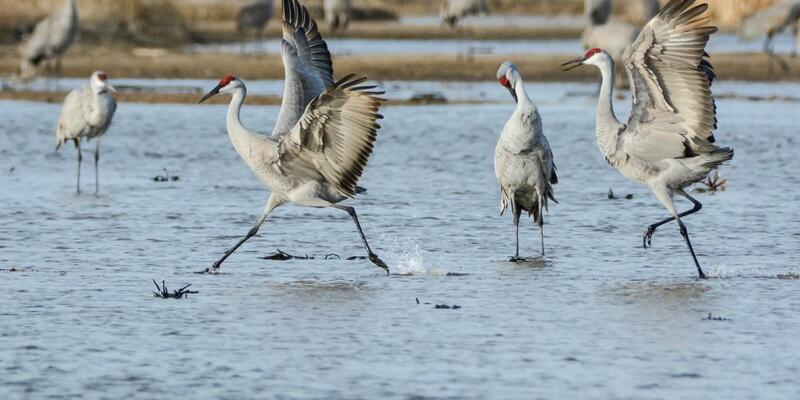 Photo credit: Of the world’s population of 600,000 cranes, 85 percent come through Nebraska. The birds stage on the Platte River and use leftover corn to gain weight for their flight farther north. The NRT thanks Emma Brinley Buckley for granting us permission to use the landing-page photograph of cranes dancing on the Platte River as part of their mating ritual.